Uncle “J.J.” and several handy friends knocked out a wall to add six feet to the small 10-feet by 9-feet space. On 15-feet window wall: Built in a window seat, with bookshelves on each end, and two roomy, half-cupboards underneath. On other three walls: Wall rails and one-half wainscoting. Floor covering: Wall-to-wall, commercial grade carpeting: Colors: Pastels in pink, rose, cranberry, mint green, forest green. Pattern: Splashes and Swirls. Bed Furniture: Wood twin bed, 6-drawer dresser, 2 night tables. From uncle’s elderly neighbors. Old wooden desk and chair. Shared by her mother and “J. J.” as children. Small arm chair. Once used by older cousin, now in college. Toy chest. Originally belonged to her uncle. Bean bag chair, vinyl. Color: Hot pink. New. A gift from that cousin in college. Four-shelf, three-drawer unit. For stuffed animals and dolls. Yard sale purchase. Bulletin-White board. For hanging above desk. Purchased at Wal-Mart. MY JOB: Paint and finish coat everything paintable. And, there was a lot. Susika chose her new room’s paint colors from Glidden’s® “Make It Magical with Disney” line. Color scheme: Soft white, pastel pinks and greens, also tinted forest green. Paints used: Interior semi-gloss and high-gloss latexes; also artist acrylics. Ceiling: Glidden Color No. WDPR03. Color: A Wave of the Wand. Finish: Popcorn textured. Upper and built-in walls, closets: Color No. WDPR03. Color: A Wave of the Wand (tinted Pink). Rails, vertical wood wainscoting, doors, trim; also window and cupboard doors: Color No. WDPR08. Color: Fairest of Them All. Furniture: Color No. WDPR10. Color: Water Lily. 33-year old 4-shelf/3-drawer unit: Base coat Color No. WDPR03. Color: A Wave of the Wand; Glazed Top coat: Color No. 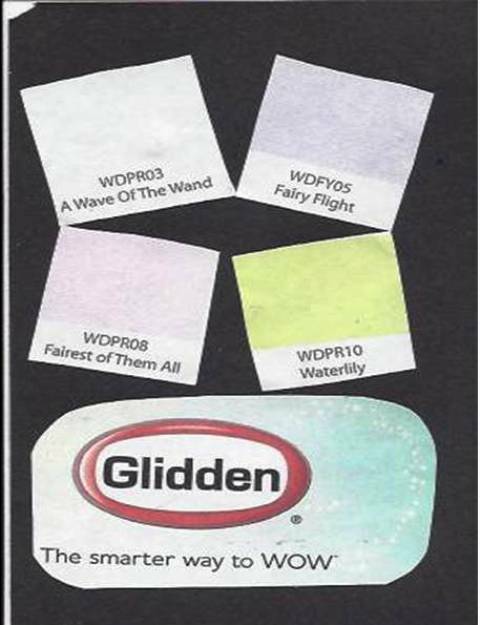 WDPR10 Color: Water Lily. Faux application: Random sponging. Tops of dresser and night tables: 2-coat Faux glaze. Coat 1: Color No. : WDPR10. Color: Water Lily; Coat 2: Color No. WD FY05. Color: Fairy Flight. Faux application: Sponging, Ragging. Built-ins and Window Seat Wall: Natural Stain; Sealer/Finish coat: Low-gloss polyurethane. The entire painting project took a little more than a week. I used a large, cleaned out shed to re-finish the furniture pieces. It was equipped with central A/C. All other surfaces and areas were primed and finish-coated inside of the room. Stains, finish coats: Miniwax sealers, stains, varnishes, polyurethanes. Painting and decorating children’s rooms is a lot of fun. Especially, when the painter is included in the project from the theme, design, color, and pattern selection stage. Every project is different. Every child’s preferences and needs are unique. The elements – theme, design, color, pattern – vary a lot. The products and materials used, in combination, are always one-of-kind. Working creatively within the budget draws on untapped energy, imagination and resources. A special sense of satisfaction bubbles forth as a child’s “special space” takes shape. Susika’s completed room was very special for an added reason. She was a war orphan, legally adopted by her only living adult relative: an American military officer. Susika’s mother, the military officer’s sister, was an American educator that taught the children of enlisted officers stationed in the Middle East. Her father was a U. S. educated Middle Eastern professor and administrator. Thank you, fellow painters and decorators, for brightening the lives of others. One surface stands out in both residential and business settings: a smooth table top. This includes the kitchen variety, wood desks, living room coffee tables, lamp and corner tables, and many others. A top, which has a fine finished surface, has always been a desirable, and valuable, addition to any living and office space environment. The goal is to create an ultra smooth, high performance finish. One where the grain of the wood or painted surface is pleasing, aesthetically. Typically, the choices of finish include (1) a stain-clearcoat application and (2) a semi-gloss, or full-gloss oil-based coating system. The stain-clearcoat uses a semi-gloss or full gloss coating system. If the table top is to be painted, a semi-gloss or gloss oil-based paint is recommended. – Includes: covered floor (eg. dropcloth), adequate lighting and. proper ventilation. 2. Proper safety attire, gear and equipment for finishing process. – Includes: Safety glasses/goggles, rubber gloves (up to mid-forearm), breathing respirator. – Suggested: Disposable work suit. 3. Necessary items such as products, tools, supplies and equipment. – A. Products: Coating(s), primers, paint and varnish remover, lacquer thinner, etc. – B. Supplies: Mild soap and water, sponges, garbage container, “Tack rags,” clean/soft rags, masking tape, clear plastic sheeting (roll), clean drop cloth(s), sandpaper (grades No. 120, 180 or 220, and 320 or 400). – C. Tools: Scraper, wire brush, paint/finishing brushes, rollers/roller covers, putty/wall joint knife; also tools for painting process. – D. Equipment: Sander (air-operated or electric). 1. Remove top surface layers from table top. B. As finish begins to lift, scrape clean until no more residue exists or comes off. C. Clean surface with soap and water solution until clean. D. Then thoroughly dry with a clean, soft cloth. E. Re-wipe surface with lacquer thinner to remove any residual finish, and to open wood grain. F. Leave to fully dry. 2. Sand surface in stages, using sandpapers in gradually-decreased grades. A. Begin with #120. Sand entire surface in the direction of the wood grain, if it is to be finished with a stain and clear coat system. B. Sand with #180 or #220 sandpaper. C. Remove all dust, using dry, clean cloth. D. Final sand, using #320 or #400 grade paper. TIP: An air operated or electric sander can be used to promote production and ease sanding. 3. Fill wood grain with filler, if ultra smooth finish is desired. A. Evenly spread paste-type water based filler or putty onto surface, using a putty knife or wall joint knife. B. Let the filler and surface dry, according to manufacturer’s recommendation. C. Sand with #220 grade sandpaper; then follow with either #320 or #400. D. Reapply if necessary. And, re-sand surface as in “C” above. 4. Wipe entire surface clean and “tack rag” the surface in preparation for the initial finish. 5. Apply stain, using a rag or sponge. A. Liberally wipe the surface from one end of table to the other. B. Depending on penetration of stain, reapply it to achieve desired color. C. Let dry for 12-24 hours. 6. Seal stained surface with appropriate wood sealer or shellac. A. Apply a thin coat of sealer on the table top surface. B. TIP: Make several passes to help eliminate bubbling. Tools: 1 inch china bristle brush, and a 9 inch by ¼ inch Mohair, or non-shed synthetic, roller cover and frame. C. Let dry for 8-12 hours. D. Sand the surface with #220 sandpaper, followed by #320. E. Dust the surface with cloth rag. F. Then, with “tack cloth, remove all particles. TIP: Take your time. Get it all! 7. Apply second coat of sealer to table. 8. Apply selected top coat finish(varnish, urethane, acrylic, or polyurethane) to top. A. Use same application method used in the sealing process in step 6. B. Let dry 12-24 hours. C. and surface with dry #320 or #400 sandpaper, OR wet sand with #600 paper to dull surface sheen. D. “Tack cloth” surface down. 9. Apply second coat of top finish. B. Sand using suitable graded sandpaper. C. Tack surface if multiple coats are desired, or specified. TIP: After surface has fully cured, a wax can be applied for protection. 1. Painting a table top. B. Sand in stages. TIP: Sand after each step, also before applying each finish coat. C. Fill low areas as needed. D. Wipe surface with tack cloth. E. Prime the entire table top if necessary. * TIP: The quality and appearance of the final finish will depend, in large part, on the careful and thorough removal of maximum layers of previously failed coatings. 1. Apply the paint or clear finish as thinly as possible. 2. Clean and “tack cloth” the surfaces between each stage of sanding. TIP: The table can be finished using a fine spray finishing method, if an automotive-like finish is desired. Refinishing table tops tends to be a standard part of any hotel or facility painter’s job. RELAX! if this is the first time you’ve been faced with refinishing a table top. TAKE YOUR TIME! Do one table first. ALLOW YOURSELF plenty of work space. Great ventilation. Low or no traffic area. Allow yourself plenty of BETWEEN time. Between steps. Between coats. Between steps and dry times. Everything Looks Different Up Close – Even a Great Paint Job! Notice the term, “great” paint job, not “good” paint job. Up close: The 12-inch appearance surface test. That means: Up close, the painted surface will look at least as good as it does less than twelve inches away. That means: Up close, an inspector will see no paint runs, holidays, brush strokes, uneven tones (spread of paint), splatters, roller streaks, etc. That means: Up close, the wallcovering panels will be smooth. Wrinkles will not be present. Small bubbles will disappear after the adhesive dries and the wallcovering shrinks (2-5 days). That means: Up close, the seams of side-by-side wallcover panels will be “seamless seams.” No gaps, mismatches, stretching, etc. That means: Up close, the seams of natural-fiber wallcover panels will show slightly, because of the natural variation of color. That means: Up close, the patching and sanding of the surface will be smooth, or appropriate, for that surface – and area. That means: Up close, the touch-up of any patched and sanded surface will blend in with the surrounding surface(s) and area. That means: Up close, the drywall that has been replaced, taped and mudded will fit flush with the surrounding drywall – on all sides. That means: Up close, the entire area, when primed, will look – and feel – uniform, even and smooth. That means: Up close, a textured surface, with an evenly applied coating, will blend consistently with the areas adjacent to a random textured area. That means: Up close, a spray painted finish on a smooth surface will have a well-blended sheen. The film thickness will be applied evenly, absent of runs and orange peel on the surface. That means: Up close, wallcovering seams will be tight, blending in with the surface. The pattern will match exactly. No bubbles or paste will remain along any seam line, or on the surface. That means: Up close, a gilded finish, such as metal leaf, will reflect very little through the surface. The metal leaf will be wrinkle-free, with no tears. And, the surface will be bubble-free. That means: Up close, the drywall compound will lay smooth, eliminating all ridges from the knife pressure. The overlapping edge of compound and drywall will be ultra smooth. That means: Up close, the gloss paint finish will be ultra smooth, and show no imperfections in the surface of the substrate – whether it is wood, metal or drywall..
That means: Up close, the body filler application will leave a smooth finish, that is visually non-porous, and shows no high and/or low spots. That means: Up close, the stain finish will be applied evenly, with no visible wipe or drip marks, or floating pigment. That means: Up close, a properly sanded surface will show no deep sanding marks. With wood, sanding will be with the grain. With other substrates – eg. metals or painted wood – sanding marks will overlap in a subtle crisscross pattern. That means: Up close, every time, on every surface, the painter makes every effort to leave behind a great job! Actually, both up close, and further away than 12 inches from the surface. TIP: “Take your time and get it right!” Brian Santos, The Wall Wizard. A Painter’s View: The Collector’s 7,000 – and Home of Fine Woods! Included in the collection were soundtrack albums, DVDs, CDs, videos; ad posters, banners and trailers; autographed photos, letters and books; costumes, masks, make-up kits, and props; pens and paperweights; plates, mugs and trays; toys, dolls and games; jackets, t-shirts, caps, and jewelry; paintings, drawings, sketches; set and scene models. Even a vehicle. The 7,000 plus piece collection “lived” in a climate-environment controlled atmosphere. Marble, natural woods, glass, and special plexiglass were used extensively. Commercial wall vinyls covered non-wood areas such as closets, pantry and storage. Metals such as brass and chrome were seen in few areas. What captivated me most was the hardwoods and veneers used throughout the home. A tasteful, colorful blending of temperate and tropical hardwoods, as well as a few softwoods. “R”, the engineering department’s assistant supervisor at the Seralago Hotel & Suites, would have gone speechless. A carpenter craftsman and finisher, he would have been fascinated with the selection, combination, and use of the various woods. The hardwoods and veneers carried your eye from room-to-room, and area-to-area, in a smooth and effortless way. Master woodcrafter at work. Paneling, built-in shelves and cases; cabinetry and cutting blocks; general and decorative mouldings, trims and joinings; doors and frames, windows and trims; flooring; furniture, work stations, picture frames, etc. 1. Ash (white) – Colors: Pale honey. Properties: Good working and bending, fine finish. 2. Beech – Colors: Pale brown, flecked. Properties: Hard, good working, finish. 3. Oak (European) – Colors: Pale/Dark brown, with growth rings and silver rays. Properties: Hard to work, strong, durable. 4. Elm (European) – Colors: Brown, with twisted grain. Properties: Attractive, hard to work. 5. Sycamore (American) – Colors: Light brown, with straight grain-lacewood. 6. Black Walnut (Virginia Walnut) – Colors: Dark brown, with purple tints. Properties: Coarse grain. 1. Rosewood (Brazilian) – Colors: Dark brown, with variegated streaks. Properties: Attractive. Use: Veneering. Note: Product now banned from international trade. 2. Cedar (Brazilian) – Colors: Dark to Mahogany-colored heartwood. Properties: durable, resinous. 3. Cocobolo (Nicaragua Rosewood) – Colors: Dark brown, with colorful streaks. Properties: Tough, dense, lustrous. 4. Kingwood – Colors: Brown to Violet, even-textured, variegated. Properties: Lustrous. Uses: Turning, veneers. 5. Mahogany (Brazilian) – Colors: Light to dark reddish brown, with straight/even grain. Properties: Stable, good finish. 2. Pommelle-grained – Colors: Dark brown. Uses: Veneering. 3. Birds-eye Maple-grained – Colors: Light yellow/tan. Uses: Veneering. 1. Douglas Fir – Colors: Yellow to Pink brown. Properties: Coarse, dense, durable. 2. Ponderosa Pine – Colors: Yellow white, with delicate figure. Properties: Sable, excellent finish. 3. Scots Pine – Colors: Pink-Red heartwood. Properties: Resinous. Comparatively few homes will feature so many woods under one roof. For it to work, everyone involved in the design-engineering-build-decoration-finishing process must be on the same page. They must know the customer well. What he or she says and points out – and what is left out, accidentally or intentionally. They must know woods. Each one’s unique color, tints, grain, streaks. Each one’s unique properties and characteristics. Each one’s uses, and limitations. Then, every specialist, and every craftsperson, must cooperate and collaborate from pre-Phase 1 to post-Phase 10/20/whatever. Until way after the complete project is done. I would have loved to be the finisher/painter/decorator that worked on the collector’s home. Many aspects of the project would have offered immense opportunities in fine wood preparation and finishing. I’ve worked on a few similar properties. A maximum of seven types of woods, excluding furniture, were installed. Whatever you collect…whatever size your home may be, invite fine wood into your life. Even a little wood will do wonders for your living style, your spirit, and your soul!